Regardless of magnitude, debts must be repaid. Those who are able meet their minimum monthly payments often end up paying as much as 40% of the principal in interest over the life of the loan. Those who are struggling with making their payments cannot rely on bankruptcy to provide relief. 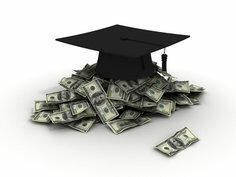 For most, filing for bankruptcy will not discharge student loans unless the debtor can demonstrate “undue hardship”. While the definition of “hardship” varies from state to state, it is generally a difficult standard to meet. Chapter 13 bankruptcy, which reorganizes debt requires the debtor to pay off the interest. Student loans rarely fall under Chapter 7 bankruptcy, which liquidates debt altogether. Students who are in default should be aware that the Internal Revenue Service can withhold tax refunds to pay off creditors for overdue student loans. Additionally, creditors can garnish wages without even filing a lawsuit against the debtor in question. As the recession forces more and more people to seek lower-paying jobs, it’s important that those contemplating higher education keep in mind the long-term affects of student debt and determine whether they will be able to realistically pay back the debt they take on. If not, the consequences may be devastating.